The content of this article provides interesting history, facts and information about Death of a Gladiator. A Gladiator was expected to give his life with dignity and courage. The death of Gladiators was even ritualised to provide a stage for his death. 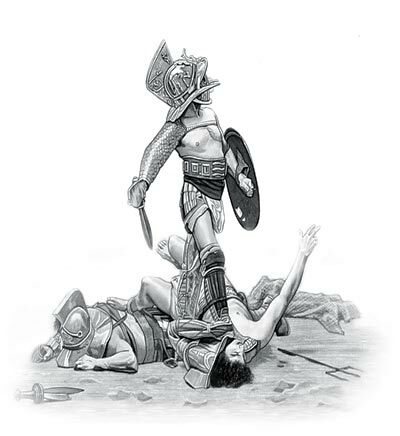 A defeated gladiator who was refused missio was expected to kneel and courageously accept death. His opponent would stab him with the gladius (sword) through the neck or shoulder blade into the heart or using the gladius or pugio (dagger) would stab him in the throat. This ritual death was called iugulatio. The dead gladiators would be dragged from the arena accompanied by the playing of trumpets. A gladiator could be killed by another gladiator or, in the case of the animal fighters, by a wild beast. Badly wounded , but still living gladiators (these were the noxii, who had been sentenced to death in the arena), would receive a fatal blow to the head with a massive hammer inflicted by a man dressed like Charon, the Ferryman of the Underworld. The bodies of the noxii gladiators would then be dragged from the arena sometimes by hooks in their heels, to make this chore easier. Their dead bodies were dragged through the Gate of Death called the Porta Libitinensis, This name derives from Libitina who was the goddess of funerals. The corpses of the gladiators were then taken to the Spoliarium. Some Roman citizens, often those in debt, sold themselves into gladiator schools for money. These free gladiators were called auctorati. There were also experienced and trained gladiators, referred to as veterani, who were extremely valuable assets. Gladiators who had obtained their freedom, called Rudiarius, the auctorati and the veterani were therefore treated completely differently to the noxii. A wounded Rudiarius, veterani or auctorati would be afforded some dignity and care and would be carried from the arena on a stretcher. Only backstage would someone check if a rudiarius, veterani or auctorati gladiator was really dead. After fights, the bodies of the gladiators were disposed of depending of the status of the fighter. The bodies of noxii and damnati were either buried or thrown into rivers, this being the traditional Roman disposal method for the bodies of executed criminals while other Gladiators were often buried with honours by their "union" (collegia) or friends. There are rumors that the bodies of dead gladiators were used by animal trainers. It is said that human parts were fed to wild animals to get them used to the taste of human flesh. Such animals were therefore more likely to attack humans thrown to them in the arena. The gravestone also holds the entry "Delicatus made this for his deserving comrade-in-arms" which confirms the notion that some gladiators were buried with honor. The content of this Death of a Gladiator category on life in Ancient Rome provides free educational details, facts and information for reference and research for schools, colleges and homework. Refer to the Colosseum Sitemap for a comprehensive search on interesting different categories containing the history, facts and information about Ancient Rome. Just like the subject of Death of a Gladiator there is hardly a page of Roman history and the Romans that is not, on some way, connected to the Roman Colosseum which became a symbol of Rome, its society, culture and life.